"I said, 'This is not happening, this is only in the movies' ... He was going so fast." A good Samaritan pulled out a gun to try to stop the mayhem on the Mass. Pike. 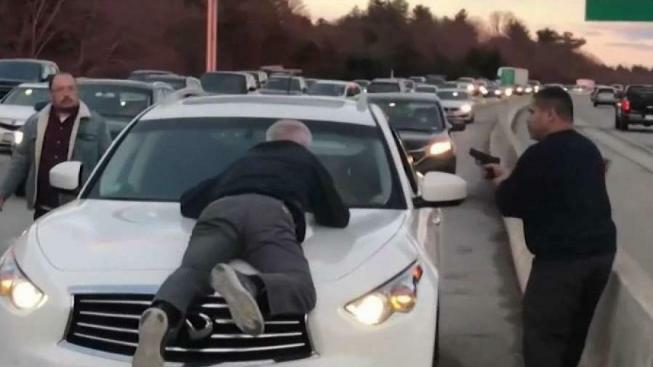 As Frankie Hernandez drove home from work Friday, he encountered the wild scene of a road rage incident on the Massachusetts Turnpike and knew he had to do something. "I said, 'This is not happening, this is only in the movies,'" Hernandez recalled. "He was going so fast." At first, Hernandez thought it was a bad accident, until he saw a man holding onto the hood of a speeding SUV. Authorities say the man on the SUV's hood, 65-year-old Richard Kamrowski, had gotten into a minor side-swipe crash with the SUV, and that he confronted the SUV driver, identified as 37-year-old Mark Fitzgerald, on foot during stop-and-go traffic. One thing led to another, and for reasons still under investigation, Kamrowski ended up on the hood of Fitzgerald's SUV. Court documents show that both men blame the other for the escalation. Hernandez, an Army veteran who served in the military police, raced up to the SUV, boxing it in with his car. In video obtained by NBC10 Boston, you can see the man still holding onto the hood as Hernandez speeds up. "I'm licensed to carry, so I drew my gun as asked the driver of the SUV to get out of the car because he was not complying whatsoever," Hernandez said. Hernandez held the driver at gunpoint until Massachusetts State Police troopers arrived seconds later. In the video, you can see a trooper pull his gun out and order Hernandez to drop his gun and lay on the ground. "He has the right, he is the law enforcement, so I backed up, and dropped my gun to the side, complied to the order I was given," Hernandez said. "I just kept my eyes on the driver of the SUV because when I laid my gun to the side, I didn't want him to rush at me or rush at the gun." Eventually, troopers released Hernandez and gave him his gun back. Hernandez is just glad he was there to help end the scary ordeal. "This is something I don't want to see again, because it was a live person almost getting ready to die, basically," he said. "Always be prepared and keep calm because when you have a firearm, you got to be mentally fit." Fitzgerald and Kamrowski pleaded not guilty to their charges in Waltham District Court on Monday. Authorities are still investigating the road rage incident.